Amazing Views - The name says it all! You will receive the perfect mountain view. 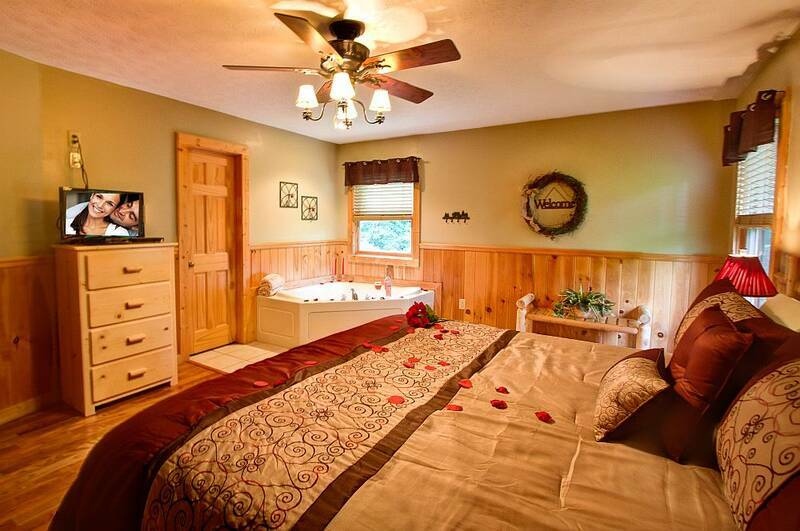 This 2 bedroom 3 bath cabin has King beds in each bedroom and a queen in loft area sleeps 6 people. There are several areas in and around the cabin to see the amazing view. 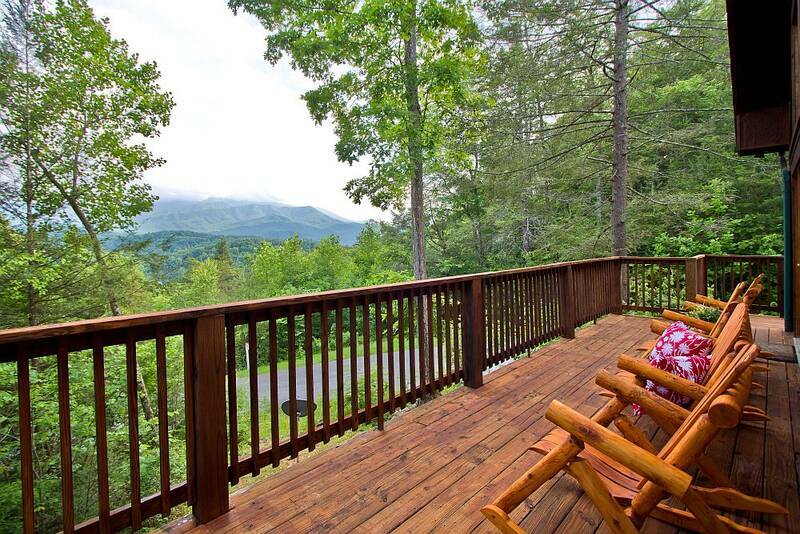 Enjoy the view of the Smoky Mountains as your are drinking a cup of coffee in the morning outside on the deck. Cabin was more than we could have imagined. Very clean with an awesome view. The cabin was as advertised, great view with all the amenities needed for a great weekend. Close enough to Gatlinburg and Pigeon Forge for shopping, browsing and good restaurants but still had the mountain retreat feel. 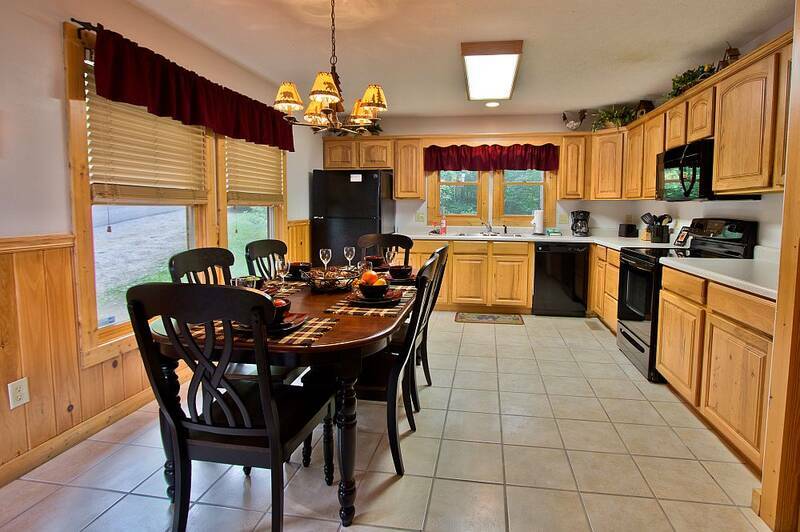 Well equipped kitchen with everything you need for preparing your in house meals. View was amazing, cabin was clean and instructions were very detailed on what to do when leaving, cleaning and when it came to the Hot Tub. Heartland's customer service was easy to work with and very friendly. The only complaint I had was not being able to get the extract address to the cabin until I signed in that evening. I did have to go out of my way to sign in at Heartland, but at least I got to see a beautiful view on the way to the office. I will definitely be using them again when we come up in the summer. 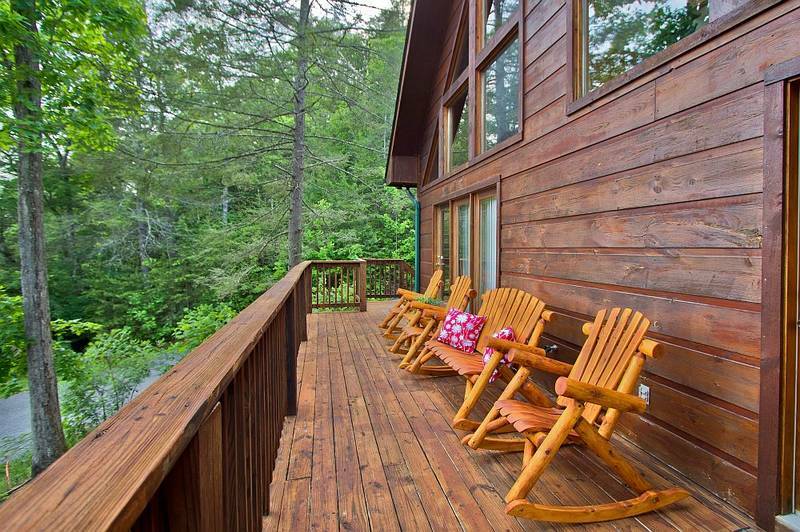 From the moment you walk in to the balcony outside the cabin is truly beautiful. 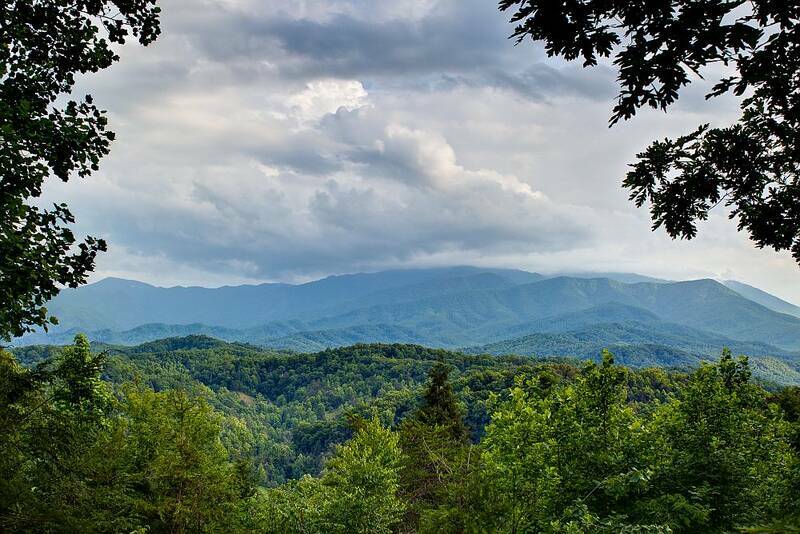 You can see the smoky mountains from inside the cabin and definitely outside on the balcony. Cabin was big and spacious. 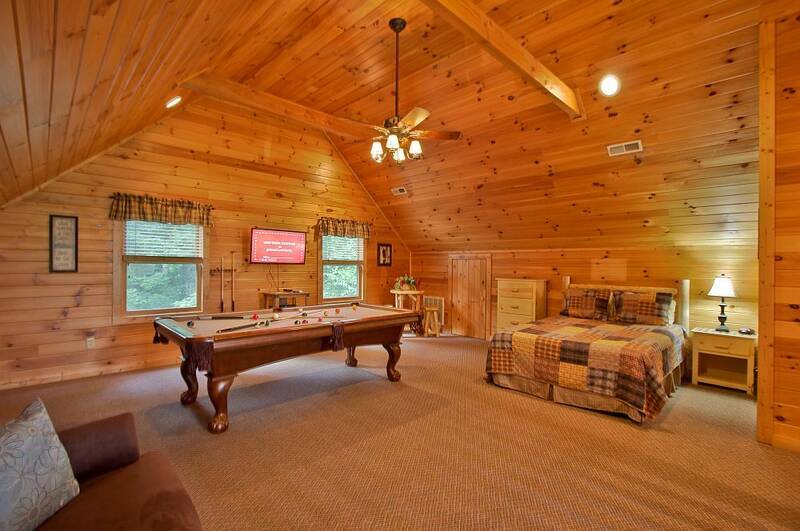 There’s a Pool table to enjoy or you can relax under the fire during cold winter nights. I will definitely be coming back. This was a great cabin with a wonderful view. Very clean and really relaxing. Loved it. Side note bring wood. Love Ashley help. Cabin was as advertised, beautiful n location and views. Staff was friendly and helpful at check-in and check-out. 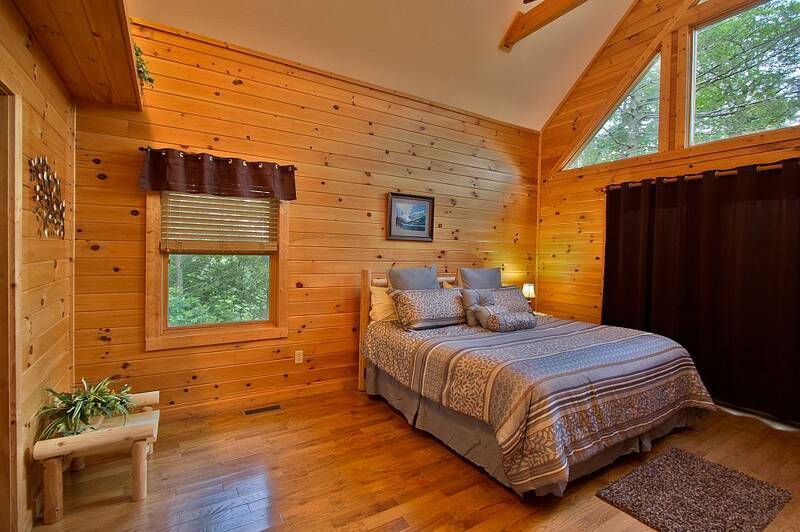 This cabin is comfy and well decorated. The billiards table is also very nice. Very close to Trillium Gap trails. The staff was friendly and helpful anytime we called in to ask questions prior to our stay. The cabin itself was everything we expected - very spacious, comfortable, and, as stated in the name, an "Amazing View." 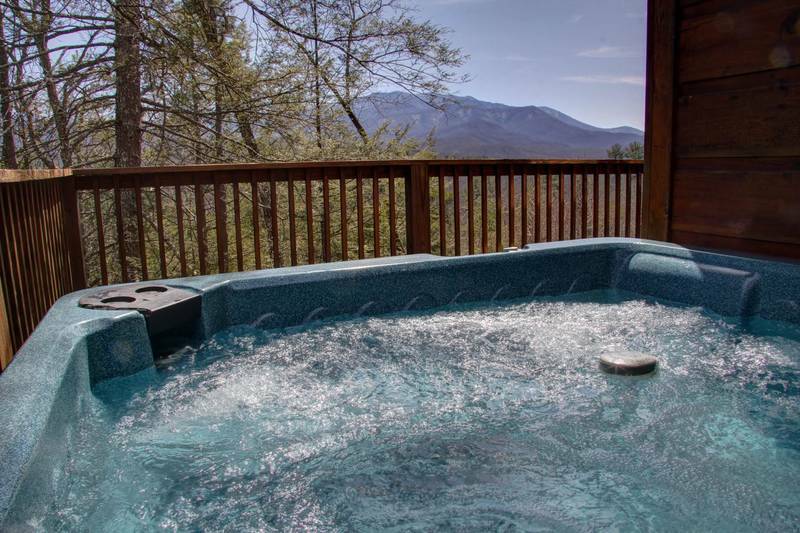 We would highly recommend this to any of our family or friends looking for a getaway in the mountains. Cabin is just like the photos! We were here for 7 nights and had a wonderful time. 12 minutes (according to GPS) to get to the grocery store and 20 minutes to the National Park entrance. My husband and I and our 18 and 21 year old daughters stayed here and if we make it back to the Smokies will definitely use Heartland again. Amazing Views is gorgeous and was very clean. We ate at least 1-2 meals a day at the cabin and used the washer/dryer. Bring your own spices etc to cook with but pots and pans and dishes were all in good condition. Amazing views lived up to its name! 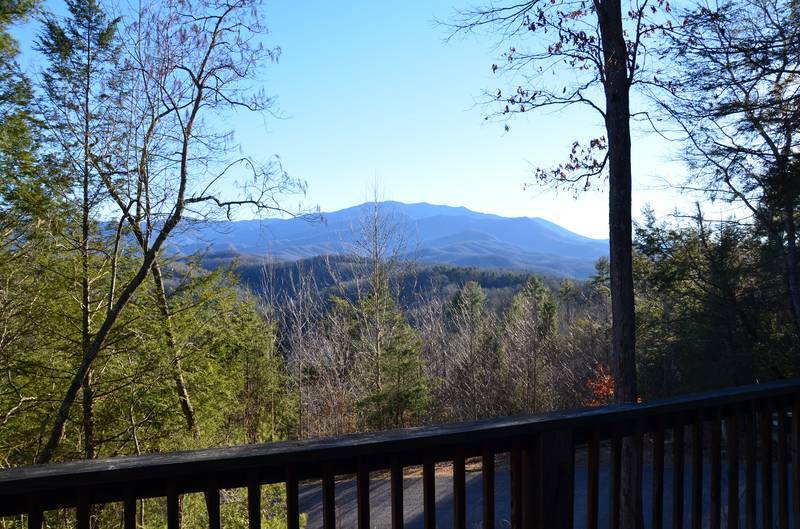 Beautiful cabin, and gorgeous views of the Smokies. 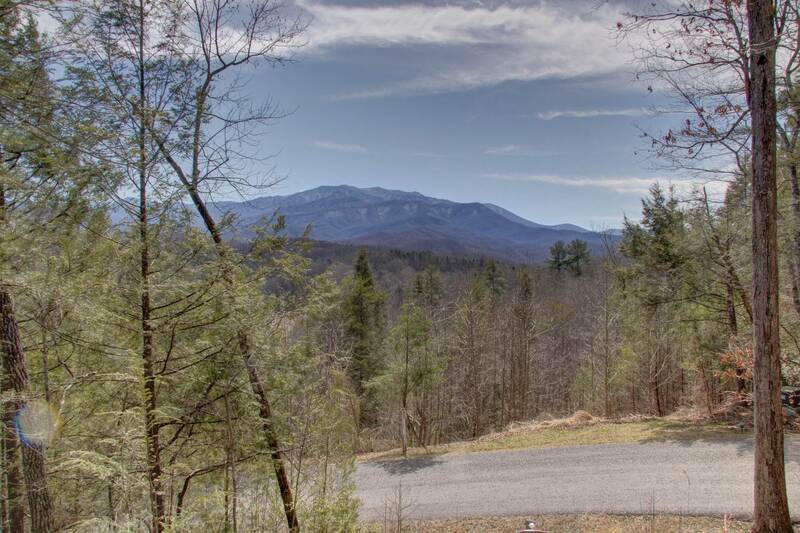 Close to Gatlinburg and the Great Smoky Mountain National Park. Will definitely be coming back! Such a peaceful and relaxing stay. We had a wonderful time and had amazing views! Staff was very welcoming. Thank you! This cabin was exactly as it was advertised. It was very clean and the views were truly incredible! 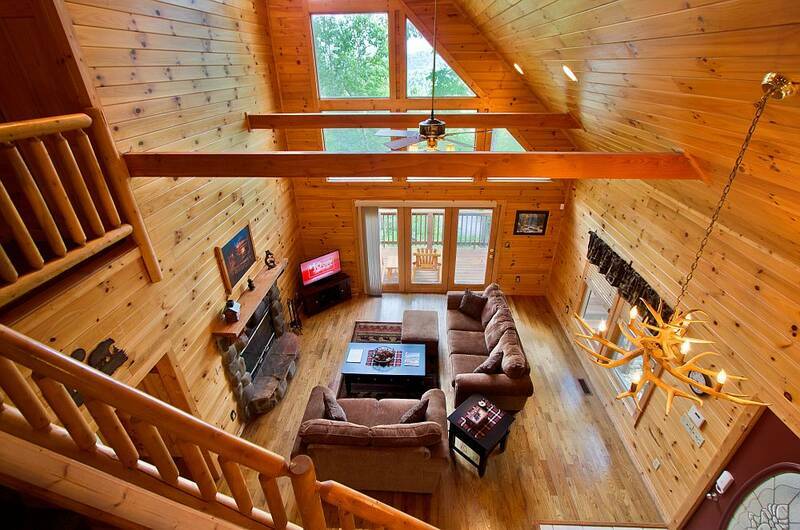 Heartland is the only company we use for our cabin rentals. This was our sons first stay and it’d been over 10 years since our last one, but Heartland exceeded our expectations once again! The cabin was wonderful. Amazing views. Check in was quick, and our cabin was avaiable earlier than expected, which was nice. The cabin was great and the view was amazing. The stay was great. The cabin was was as advertised. Great location. I would recommend this cabin and any other cabin that is managed by heartland rentals. Everything was perfect and the view was amazing ! The Amazing View is an amazing cabin. The cabin's location was excellent. We were secluded enough to enjoy the beautiful mountain views and close enough to town to enjoy the activities. The cabin was absolutely beautiful and very clean. I will definitely be staying there again. I highly recommend this cabin. After reading the reviews we already had very high expectations, but when we got to the cabin it surpassed them. It was very clean, had a nice spacious layout, and the view was much better than the pictures. This lovely place fit our needs in every way...no surprises! Everything was just as viewed online! Impressed with the cleanliness, kitchen and bath supplies, and nice/tasteful d�cor. We so appreciated the friendly, courteous, and accommodating office staff. We look forward to staying again soon with Heartland Rentals, and will recommend you to our family and friends. Thank you, Heartland, for a making this a wonderful experience! Everything was great as usual. We have stayed here before. Beautiful cabin. Beautiful view. I would have given it a five but there is no internet. Also no ESPN. I love sports so this was one channel I missed. Spacious cabin with great views! 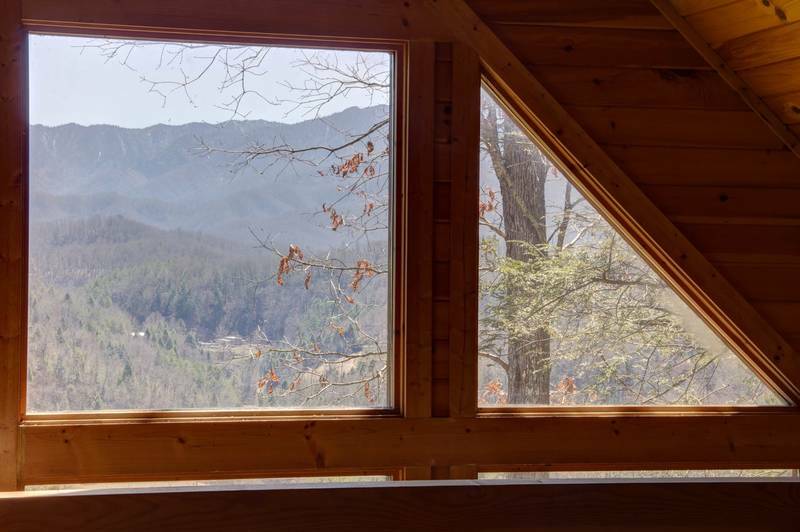 This cabin truly does have "amazing views" of the mountains, mainly from the large side porch and the living room area windows. The cabin was VERY clean when we arrived. I'm not a builder but this looks to be a fairly new cabin. 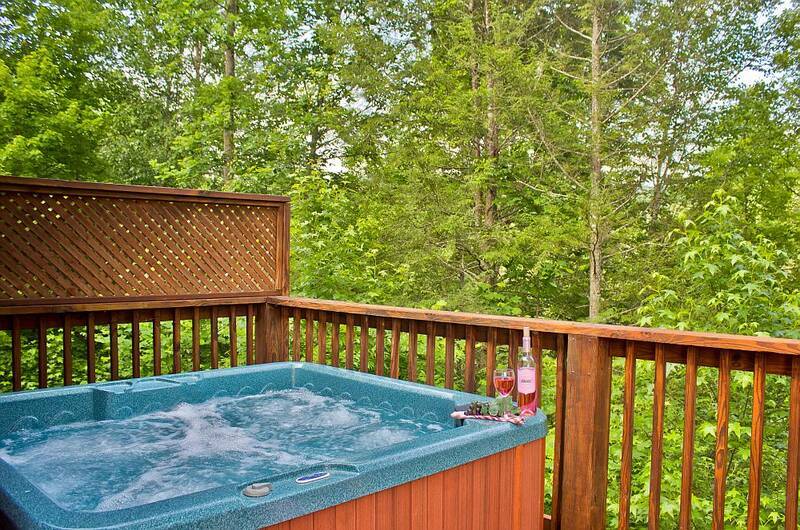 My wife loved the outdoor jacuzzi, which was also clean and ready to go when we got there. It has a cover on it (easily removed) to keep leaves and such out. The washer and dryer unit was much appreciated after long days of hiking. The refrigerator includes an ice maker, which helped cut down on how much bagged ice we had to buy. Speaking of buying things, you're about 10 minutes away from the local Food City grocery store and gas station. The only suggestion for improvement we would make would be to bear-proof the trash can that is on the front porch. In summary this cabin was well worth the money, and we would certainly stay there again on future visits to the Smokies. Now if they'd just add wifi it'd be close to perfect :-) ! We took our 3 boys and my wife was pregnant with #4. Along with my mom and sister, so it was a relaxing trip. The cabin was great! We enjoyed the wood fireplace and just enjoying the cabin as my wife was due soon. We will never forget this trip, as it was the last one my mom was able to go on. She enjoyed the cabin so much, and cooked breakfast for us every morning. This cabin will always have a special place in our hearts and we will be back to remember "Mimi" as this was her last trip. It was a great cabin and great people. We stayed at "Amazing Views" March 10th-12th. The house was perfect. It was actually better than expected. I have nothing bad to say about the place at all! FYI: the fireplace is wood burning, not gas, so you need to bring wood and matches. You can buy wood at Food City not far away. Upstairs is a queen bed and a futon. We had a great time and will book this house again. Couldn't have been more pleased. Everyone was so friendly. Plenty of room. so glad everyone had there own bathroom. The view was absolutely amazing! Surrounded by God's beautiful country. We had a great stay! The view really was amazing and the cabin was very comfortable! Enjoyed it so much that we will book again!!!!! The Cabin was more than expected, it was BEAUTIFUL, and very adorable inside, comfortable, roomy and decorated very nice!! The view was simply 'AMAZING'!!! The staff was very nice and let us stay an extra day at half price!! We felt like we were very far away up in the mountains which we wanted because it was our 33rd. Anniversary! 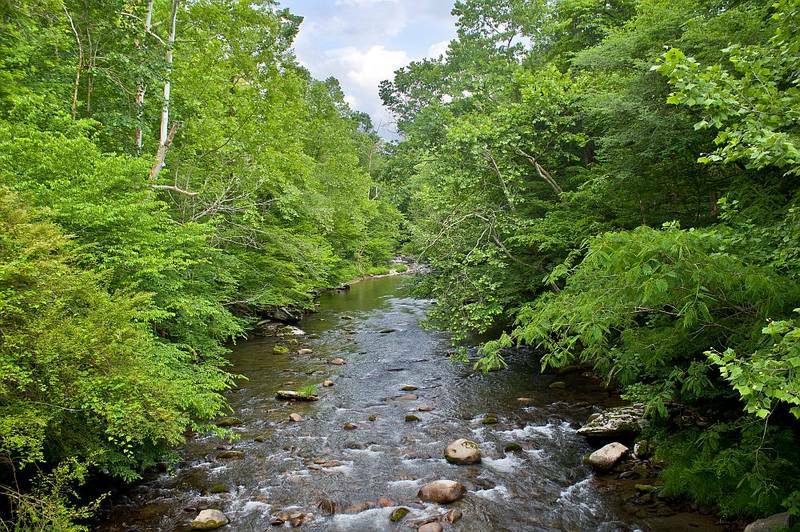 but were only about 10 - 15 min from downtown Gatlinburg. There were some trees that need to be trimmed before they get to tall and ruin the Amazing View!! We are already to Book this Cabin again!! It was top notch in every way! The name of the cabin says it all! Loved everything about the cabin. Views fantastic. Wish we had the bear-proof trash container available as a bear did get our trash can one night! Would actually love to buy this cabin!! The cabin was amazing, clean. It was wonderful! Loved the view! Need to let everyone know what tv stations you get. We couldn't get much at all. We have Comcast, so we don't know anything about direct tv. We stayed the last week of August 2016 and we could not have had a better time! 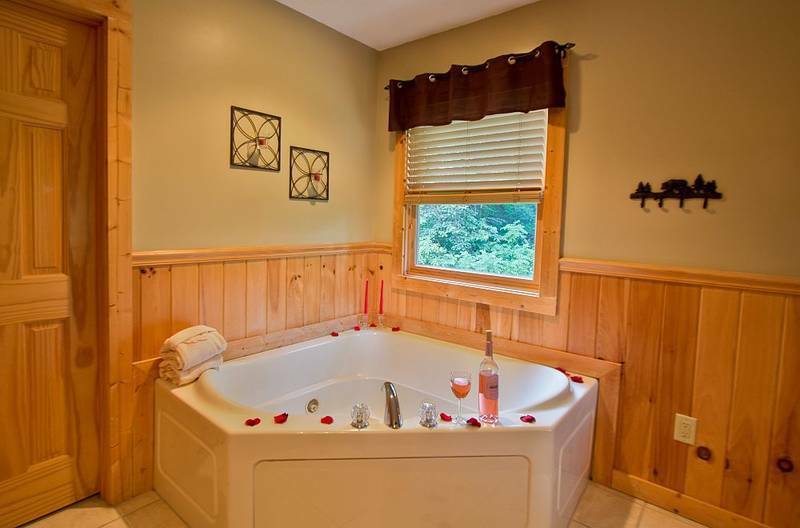 The cabin is exactly as pictured. The views are stunning. The cabin was quiet but still not too far from town. Everything about our stay was great. We can't wait to come back again, maybe in the fall this time. We will stay in this same cabin when we do. Plenty of room and the washer and dryer was a huge plus for our extended stay. We weren't ready to leave! Everything was excellent.. Very clean and a make a feel at home atmosphere !!! Cabin was very clean and spacious. We enjoyed the view and the cabin was just absolutely wonderful. Easy to get to and just enough out of town to be peaceful. The best vacation for any family. 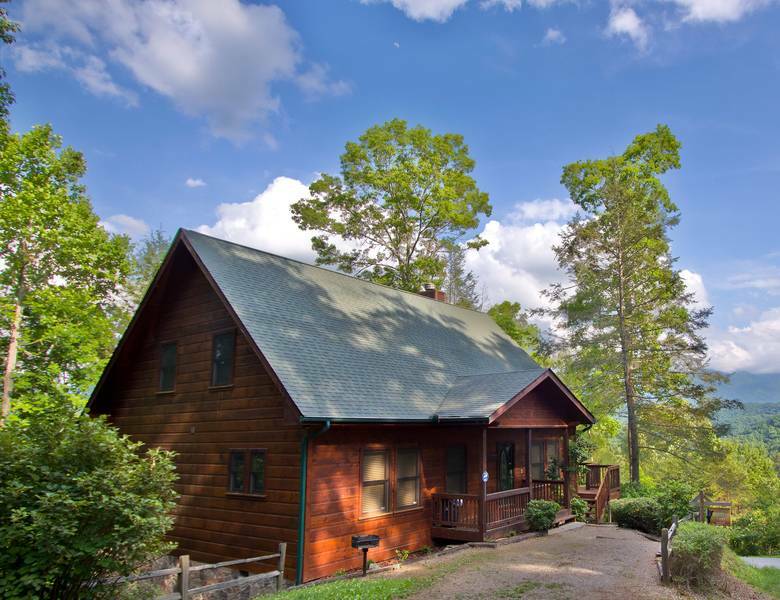 We were pleasantly surprised and also very happy that the cabin was everything the description and photos on your website showed in regards to how beautiful not only the cabin was but also the AMAZING view from the cabin of the mountains. We have shown all of our family and friends and I am betting there will be a few that are going to book a stay with you folks as well. We will definitely be returning again in the coming years. Thanks again anytime you can have as much fun as we did not only with the cabin but also having so many events so close to our location we needed more time to complete all we wanted to do. The view and place was extraordinary, and the place was beautiful and clean. We would definitely stay again. Thanks, too, for the very helpful people who checked us in; they gave us great advice on places to eat, see, and directions. 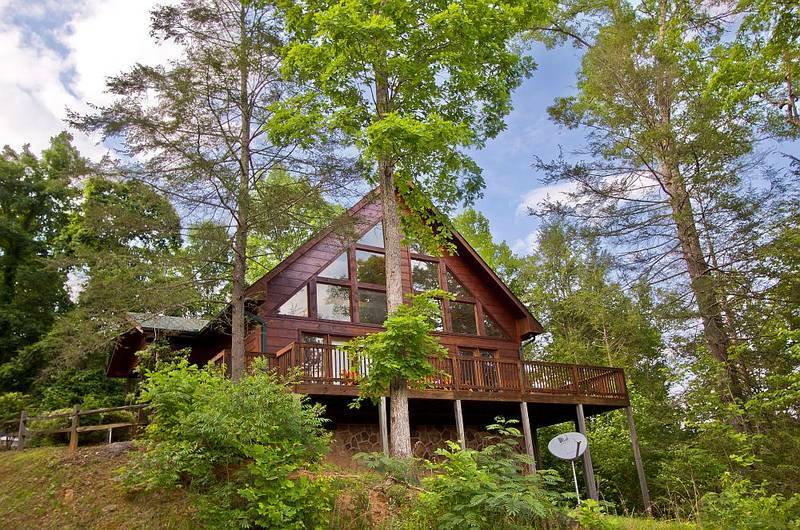 This is our favorite Gatlinburg cabin! The cabin was in great shape. Very clean. Very up to date. The view was truly amazing. Would definitely recommend this cabin. What a great cabin! The views were as promised. Very clean, well built cabin, easy driving access. I would recommend this home for anyone. This cabin was awesome, didn't want to leave. Heartland cabin rental were so very nice and helpful. The cabin was so beautiful. The view was in fact amazing. Everything was clean. It was spacious. We went with five people and it was a perfect size. The kitchen is beautiful. We had fun with the pool table and the hot tub. Greatly enjoyed the fire. It is centrally located so easy to get to everything. We really enjoyed our stay there. Overall a pleasant stay. First time to Gatlinburg/Pigeon Forge area. Cabin was very clean and well equipped. A couple of minor maintenance issues - Washer didn't work, but maintenance fixed it the same day we called. Hot tub was wonderful. Location was great too - options to avoid traffic by approaching Pigeon Forge from "around the mountain" rather than through town. Office staff was helpful and attentive to our needs. Gateway Fun Pass was a big savings too - Hatfield & McCoy Dinner show was a good substitute for the Lumberjack Feud Dinner (closed until Dollywood reopens the show under a new name in May 2016). The view from this cabin was awesome. The cabin was very clean. The bathrooms and kitchen were large which is a plus. There were no other cabins right on top of you so it was quiet. We would definitely stay here again. This is a great place to stay. Away from all the people but close to a grocery store and close enough to the action....if that's what you want. The cabin was very nice and clean. Stocked with cookware and utensils. 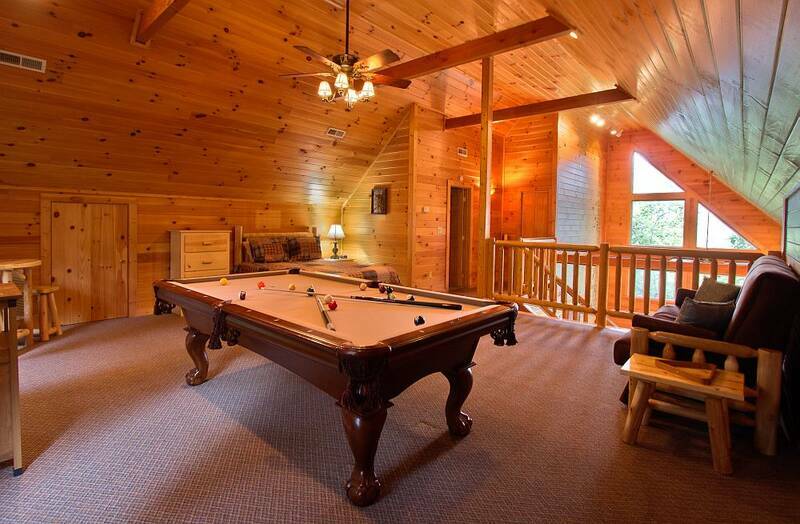 Great fireplace and hot tub....pool table in good shape. And what an awesome view. We enjoyed our stay and the staff at Heartland was terrific! Stayed for two nights in December right before New Year. The facility was very clean and very cozy. My whole family loved it! Definitely will be coming back! We truly enjoyed our stay at Amazing Views. The views were fabulous, the cabin was spacious and very clean. We enjoyed the pool table, jacuzzi tub and outdoor hot tub. First class accomodations! Spotless! All the amenities you would need for a comfortable, relaxing stay! And the views were as advertised! We had a great stay, the views are exceptional and the cabin was very clean. We stayed 4 nights and were very happy, the cabin had all the amenities you need and was just a short distance from town. We Will be looking forward to coming back next year. 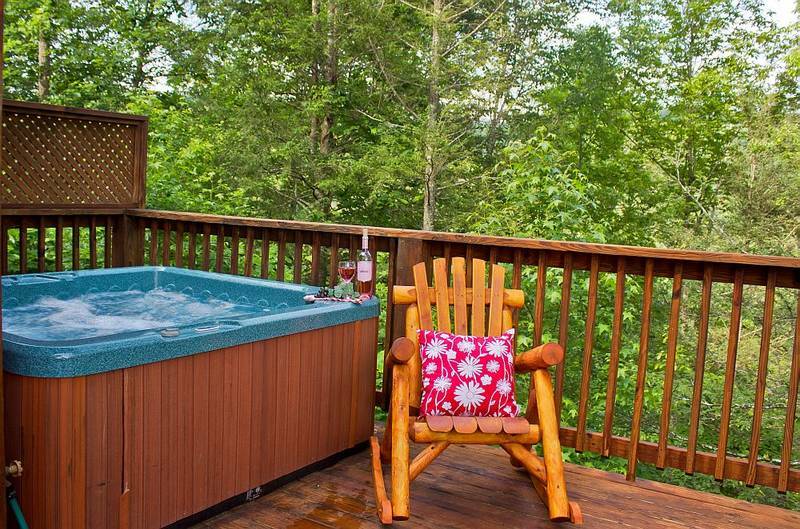 Amazing Views is a well furnished cabin located about 20 min from Gatlinburg downtown attractions, about 10-20 min from ziplines and horse riding, and about 30 min from the popular rafting locations in Hartford. The address is navigable via GPS, and has excellent roads throughout the route, which is a plus. The service from Heartland Rentals was excellent and they not only made courtesy calls to check on our arrival / well-being but they also provided excellent hospitality in taking care of our questions. The pictures and description on the website were very accurate. The cabin was beautiful and the view was excellent. Plenty of room. Enjoyed the pool table very much. Would definitely recommend to anyone wanting a peaceful stay and a great view overlooking the mountains. cabin was better than expected. No issues came up at all. Easy access and very clean. Exceeded our expectations. Truly amazing views! You cannot go wrong staying here. So much better than a hotel/motel and it was nice to be away from the downtown area! The cabin was comfortable, spacious and well-stocked for all of our needs; exceeded our expectations! 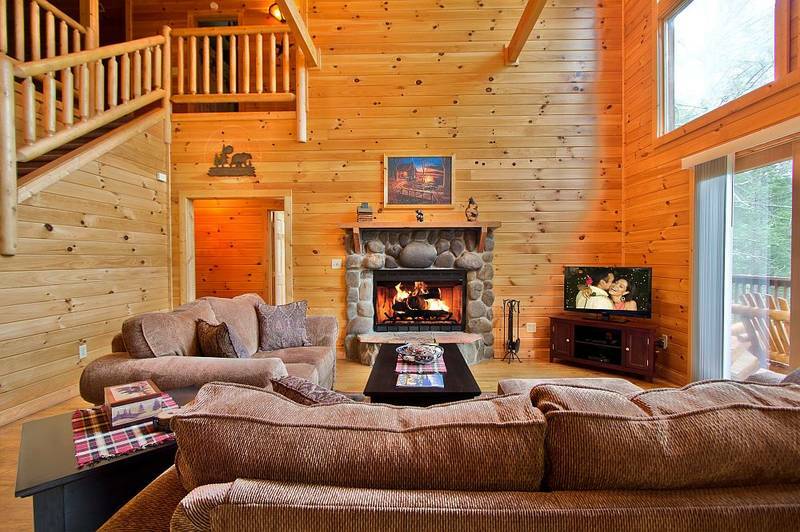 Upon entering the cabin, we were met with a pristine open living area. The bedrooms were back a hallway, which was a nice separation from the living area and kitchen. The kitchen was very large for a cabin and it was very comfortable and well-stocked with equipment for all of our cooking needs. We have no complaints and would stay here again next time we are in town! The cabin is up high enough for a truly amazing view and had easy access from the main roads. Thank you so much for an amazing, beautiful cabin...we were thrilled with everything!! This is by far the best cabin for the price we have ever rented. Amazing Views will be our family's winter vacation home from now on. Everything was absolutely perfect. Our goal in searching for a cabin was to find one close to downtown, with a great mountain view, and 3 beds / 3 baths, but affordable, and NICE. Amazing Views set the bar, for sure. The photos are all very accurate, except the view from the living room and balcony was even better than the picture. We will definitely be back again and again. Amazing Views exceeded all expectations and truly lives up to the name. The reception at the Heartlands office was very personal and welcoming. Our clerk was full of good information and very willing to help with all questions. The cabin was very warm and inviting and each room added it's own character. The views of the mountains were beautiful and we spent a lot of time on the balcony taking it all in. We would highly recommend it to all our friends. It was a week full of memories and we hated to leave! We stayed there for 4 nights and had a great time. 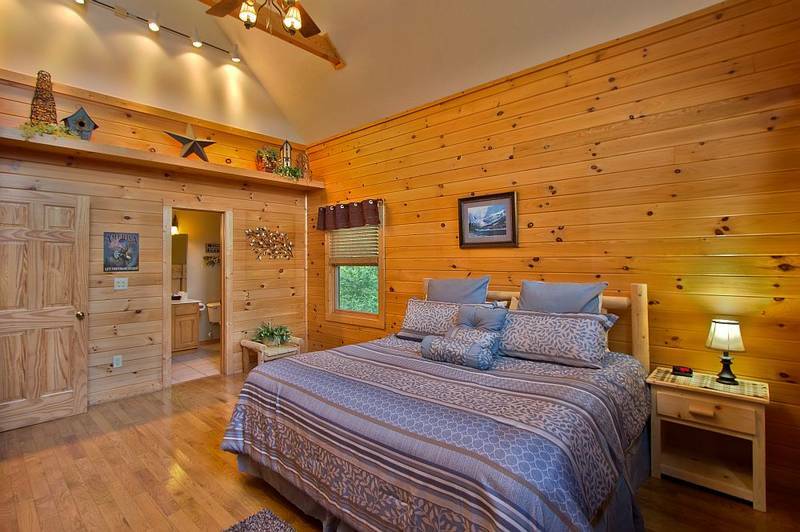 A beautiful cabins with all the amenities you need. Close to all attractions. We have already decided we are coming back.